First Dental Studio’s long history dates back to the 1920s. It started out as a single-practitioner dental office, just a quarter of the size it is today. Dr Angelo Nicholas practiced with his nephew Dr Michael Mandikos for many years. 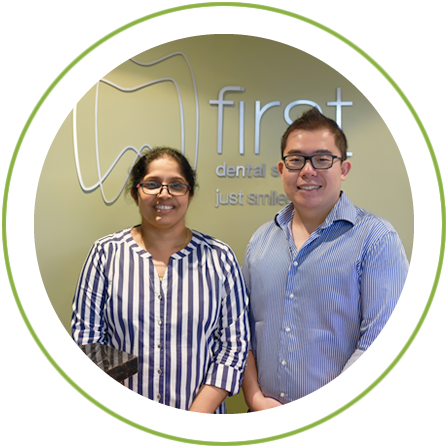 As a lecturer at the University of Queensland, Dr Michael met many students and offered Dr Vincent Wan, the chance to come aboard at First Dental Studio. Dr Vincent knew it would be an incredible opportunity to learn from two experienced, knowledgeable dentists. He soon became a partner, and shortly after Dr Meena Hegde took over Dr Angelo’s partnership when he retired and Dr Vincent’s brother Dr Allen Wan has also joined the team. Our highest priority is looking after your dental health. We see all ages, from children to adults, and have a convenient location in the CBD. Our dental studio provides you with a range of services at a convenient city location. We offer all types of general and preventative dentistry along with cosmetic, orthodontic and restorative dental solutions. Take advantage of our special offer — A new patient check-up and clean with no gap payment (for health fund participants) or for $190 (valued at $295) if you don’t participate in a health fund.